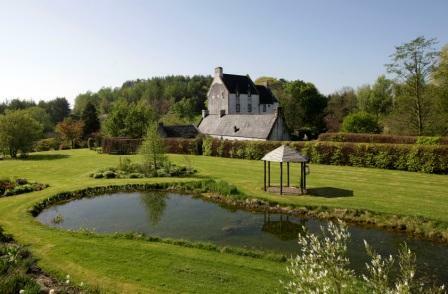 A reconstructed 15th century castle, Europa Nostra restoration award winner in private estate of 95 acres, wonderful gardens, former mill, farmland and woods. Offers over 1.1 million for the whole. 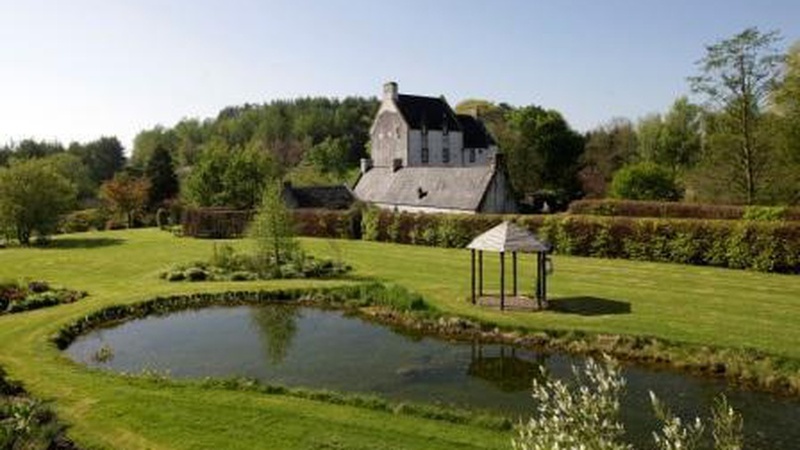 A reconstructed 15th century castle, Europa Nostra restoration award winner in private estate of 95 acres, wonderful gardens, former mill, farmland and woods - 21 miles from Glasgow; 19 from Glasgow Airport. CKD Galbraith and Savills are jointly marketing Aiket Castle, near Dunlop in Ayrshire, a wonderful reconstruction of a 15th century tower house. The painstaking work, undertaken by the present owners and completed in 1979, took three years. In 1987 Europa Nostra awarded the restoration a Diploma of Merit. The present building on the site dates originally from the mid 15th century when it was a simple tower-house, owned by the Cunninghame family. In 1586 Alexander Cunninghame of Aiket was "shot near his own house at Aiket" for his part in the murder of the Earl of Eglington, not before he had accused his wife of attempting to poison him and murdered another neighbour, Sir John Mure of Caldwell. Members of the family were declared rebels and they lost possession of their property. 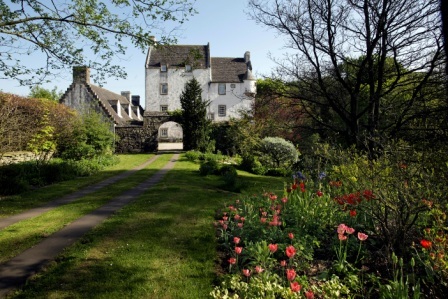 The castle was rebuilt by Cunninghame's widow in 1592, in the late 16th century style, once she got repossession. The topographer, Timothy Pont, described it in about 1600 as "a prettie duelling". New owners in the 18th century remodelled it as a gentleman's residence and removed the tower. By the 19th century it had been reduced to a farmhouse and in the late 1950s the cows lived on the ground floor, the tenants on the first and the chickens on the second! In 1957 there was a disastrous fire and the castle lay in ruins until purchased and restored in the 1970s by the current owners. Over a three year period, the unsound upper walls were demolished and rebuilt to the early 17th century silhouette. The outer walls were rebuilt in brick, using an exceptionally hard, local brick and restoring all the important features. Window margins were rebuilt in stone, as were crow steps and chimney heads, left exposed after the building was harled. An inner wall delineated the face of the original five feet thick rubble wall, with stone fireplaces, window arches and stone flagged floors. The restored castle stands on a rock outcrop on the banks of the River Glazert, which flows through the gardens and grounds, at one point only a few feet from the foot of the castle, creating a delightful setting. The house is approached from the minor public road along a private drive through an avenue and extensive gardens. There is a stone archway into a fine gravelled courtyard, enclosed by the barmkin wall, the castle and the attached 18th century cottage. In its restoration, considerable sensitivity and effort was put into combining original 15th and 16th century features with modern living requirements, to create a really comfortable and surprisingly spacious country house. There is an efficient under floor heating on the stone flagged ground and first floor floors, double glazed astragalled windows, some with working shutters, and a magnificent Great Hall with an impressive stone fireplace and huge load bearing wooden beams. The house has six bedrooms and eight cloakrooms, bathrooms, toilets or shower rooms. The four storey tower could be easily divided from the cottage to create two separate dwellings, with three reception rooms, kitchen and four bedrooms in the main house and two public rooms, kitchen, two bedrooms and conservatory in the cottage. The extensive gardens do much to complement the castle. A plantsman's paradise, they are beautifully laid out, with a spring garden, a woodland garden, a summer garden with two large oval ponds, and a large stone flagged terraced area to the south of the castle, sloping down to the Glazert River, creating a natural amphitheatre, where plays are sometimes performed. The river divides the garden so that from the formal areas near the castle there are stunning views of the wilder and more natural landscape on the other side. Across the river is a former stone mill which has been partially repaired. The intention is to create a separate dwelling house, subject to the necessary planning and building consents being obtained. There is evidence of the former dam, mill lade and mill race. The "lands of Aiket" today extend to a total of about 95 acres, of which about 8 acres are the castle, gardens, paddock, policies and mill. There are about 56 acres of grazing land, 26 acres of amenity woodland and shelter belts and several acres of more recently established woodland. The grazing land has been farmed in hand or occasionally let out for seasonal grazing. There is also a small farm steading. Bob Cherry, partner at CKD Galbraith said: "Aiket Castle is a fantastic property of grand stature in a beautifully private estate. It offers prospective purchasers the opportunity to buy into a little bit of history whilst presenting the prospect of becoming the king of your very own Scottish castle." Peter Gillespie of Savills comments: "The owners did a fantastic job when they rescued Aiket Castle from a ruin. Rather than just recreating an old building, they used their imagination and talent to make themselves a comfortable and surprisingly practical home, where they have lived for the past 40 years. The gardens have equally been a labour of love and are quite exceptional." Aiket Castle is available as a whole or in two lots. However, Lot 2 is only available for sale to the purchaser of Lot 1 and will not be sold separately. Lot 1 Aiket Castle with adjoining cottage, gardens extending to about 5 acres and a 3 acre paddock - offers over 700,000. Lot 2 Aiket Mill and about 89 acres including farm buildings, 53 acres of grazing land and 33 acres of woodland and banking - offers over 400,000. To discuss any aspect of the sale of Aiket Castle then please do not hesitate to get in touch with Bob Cherry or Lorna Donaldson at our Ayr office on 01292 268181.